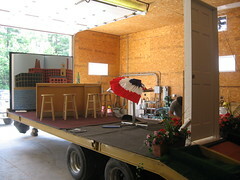 I don't know if this is bad luck, along the same lines seeing a bride before her wedding, but here are a couple "before" photos of my library's float for Chelmsford's 4th of July Parade [pdf]. Since we did a One Town, One Book program this year featuring Richard Russo's Empire Falls, that's the theme chosen for the float. It is supposed to look like the inside of the Empire Grill, a diner featured in the story, and people will be dressed in character passing out copies of the book, pins and magnets. On the right side of the picture is the diner's door, and on the far left is a backdrop painted to look like an average scene from a New England mill town (the backdrop is also a wooden Very Large Book). The dinery part will be in the middle, complete with counter, table, chairs, menus, ketchup bottles, etc. I'm sure it will look better at the parade tomorrow. 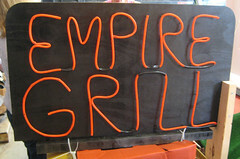 And for my part, instead of riding on the float, I made the "Empire Grill" sign. It is supposed to look like a neon diner sign, but I think it looks like what it is - some plastic tubing spray-painted neon orange nailed to a piece of plywood spray-painted black. But at least people will be far away, and it'll be moving. I’ve never met a certainty I couldn’t misconstrue.